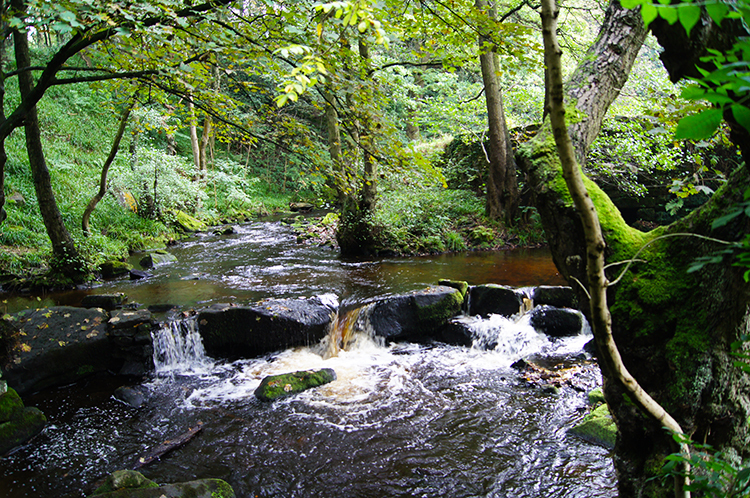 Summary: The Rivelin Valley in north-west Sheffield links the city to the Peak District. 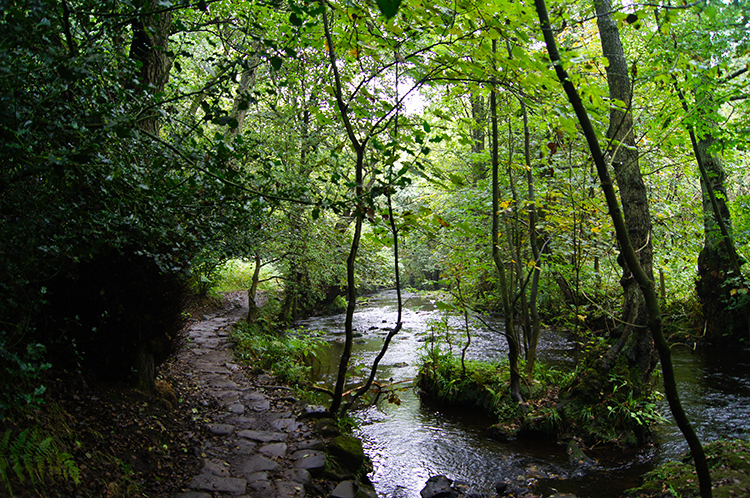 This walk follows the valley downstream and visits historical remains of some of the watermills which played a key role in the evolution of the cutlery and steel industries of Sheffield. Since the closure of these rural industries which homed themselves in Rivelin the valley has been reclaimed by nature. The first half of this walk which starts in the eastern Peak District moors heads along the southside tops over the Rivelin Valley before descending into the valley at about the half way point. 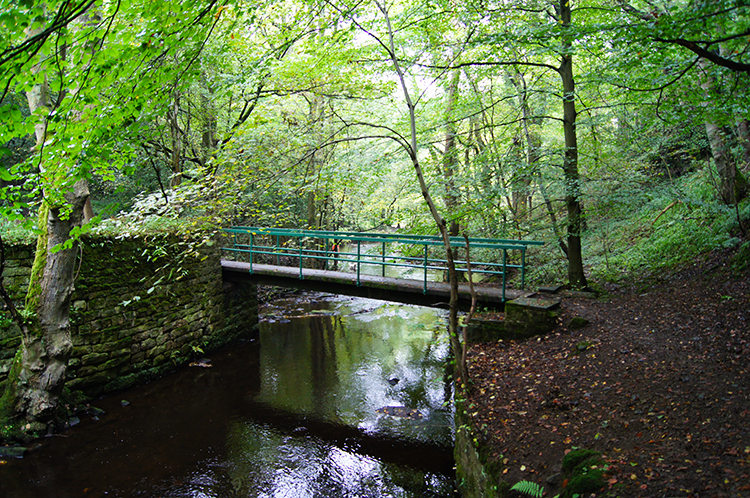 The latter half of this walk follows the Rivelin Valley Heritage Trail besides the River Rivelin and to the sites of some of the picturesque mill ponds which have been reclaimed by nature now that the deserted and demolished mills have no need of their waters. The Walk: It was a grotty morning to say the least but I was not going to pass up the opportunity of a walk which offered a step back into the industrial history of Sheffield. The alternative was a day in Sheffield City Centre with my wife and step-daughter. No doubt they would have shopped until they dropped while I spent my time waiting for them in book shops and cafes; not too bad a thought. But hey, the walk won out as it would have nine times out of ten. Persistent heavy rain would have sent me into the city. It was not that bad. 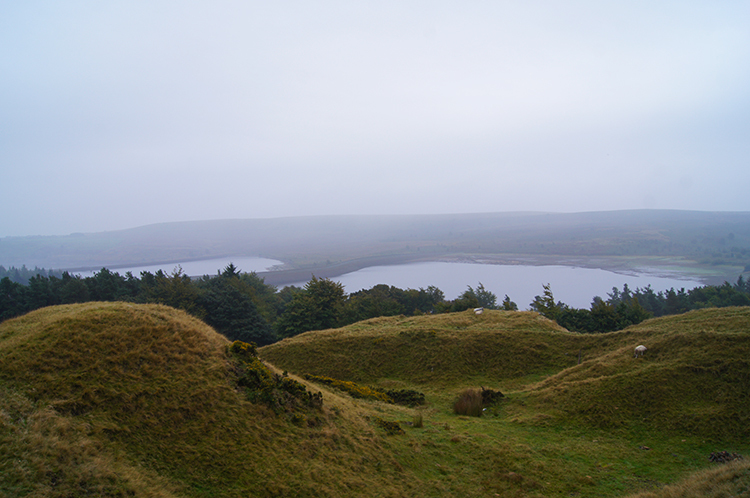 So, with my plan made of a linear walk which would lead me back to my step-daughters home in Walkley I requested my wife to drop me off at Redmires Reservoir on Hallam Moors. She duly did so and five minutes later on was on my way. I was sure the clag was set in for all morning but at least it was not raining. It was damp though, one of those heavy wet air mornings typical of England in mid September. My outer walking clothing was damp soon after I had set off. Not from rain, from the dampness in the air. I climbed from the roadside at Redmires Reservoirs where my wife had dropped me off to the disused quarry just north of the reservoirs. I had ascended 50 metres to a height of just over 400 metres in just ten minutes. I was already at the highest point of my walk. Despite local undulations on my way to Rivelin Park it was practically downhill all the way from now on. The downhill ascent started as I followed the well used path northwards from Redmires Reservoirs across Hallam Moors towards Round Hill. On my way on the gradual descent over the moor I met a few hardy weather walkers and a few fitness joggers making use of the gorgeous trails so near to the big city. 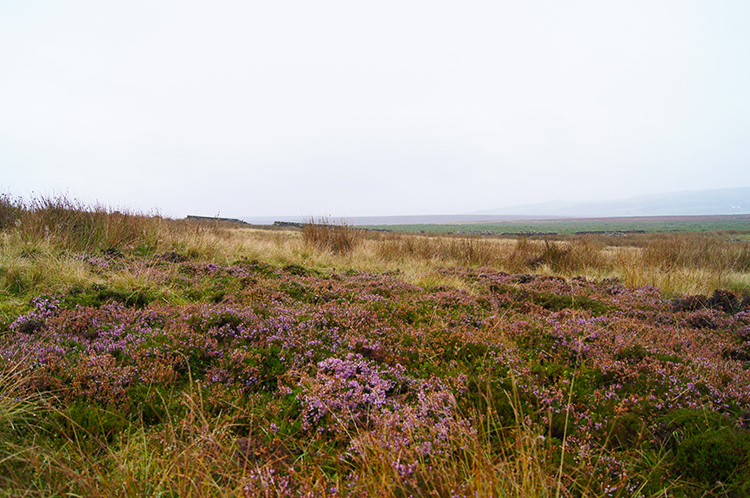 Some heather was still in bloom and showing heartening colour despite the grey sky gloom. It made me smile. I turned a perfect right angle from northwards to eastwards on Round Hill and headed across the brow of Reddicar Clough. 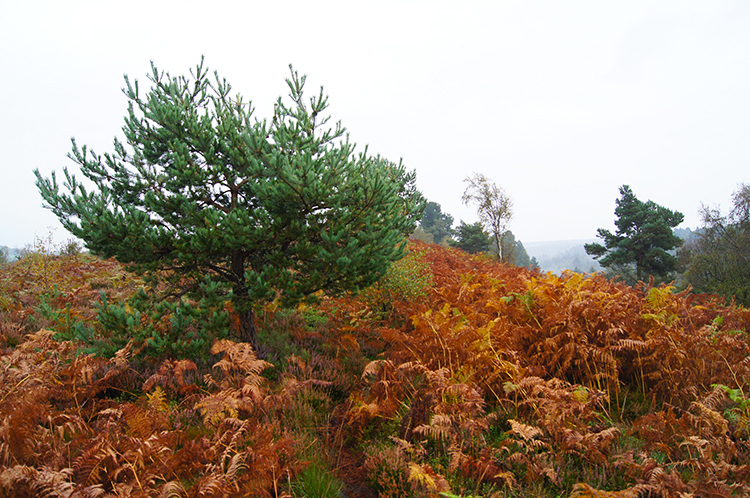 The ferns covering the moor had turned on the clough, from lush green to a brilliant golden brown. The colour contrasted well against the deep green of the few spread Junipers standing proud on the hilltop. My boots which had damped on the low grasses of Hallam Moors were saturated by the time I had crossed Reddicar Clough, the damp clinging to the ferns having transferred all over my trousers which had drained to the boots. I mused "I should have put my gaiters on". 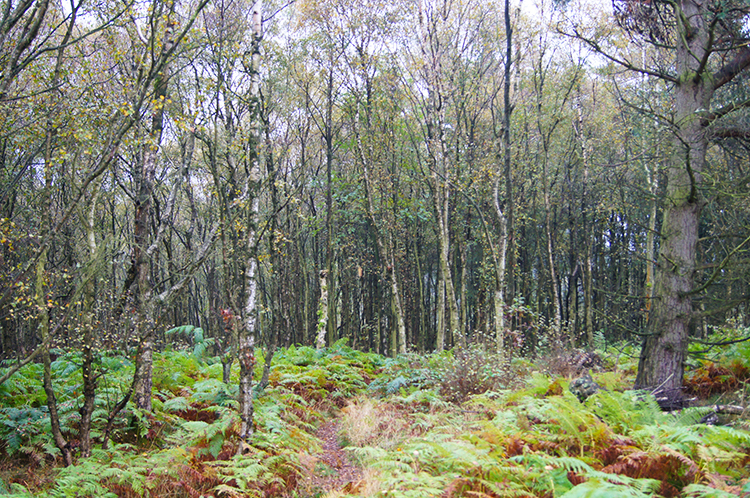 Fortunately the ferns thinned out as I entered the woodland of Wyming Brook Nature Reserve. My socks squelched inside my boots as I walked along the paths weaving their way through the woodland, paths once set aside for the exclusive use of the nobility when the site of Wyming Brook Nature Reserve was part of the hunting and hawking grounds of Rivelin Chase. Thankfully society has moved on since then. The reserve was a lovely place to wander through. Despite my damp feet. I came out of the woods to reach the good hard ground of Wyming Brook Drive, a hard unmetalled bridleway. Now that I knew I was on ground which would not soak my legs and feet I stopped to sit on a low wall, proceeding to take off my socks, quick dry the inside of my boots as best I could, wring out my socks, and re-shod myself. I wished I had carried fresh socks as I often do on walks but not this time as I thought it a doddle. Still after the initial hit of putting on damp socks my feet warmed as I walked on the good ground of Wyming Brook Drive. Once warmed I never thought of wet feet again. 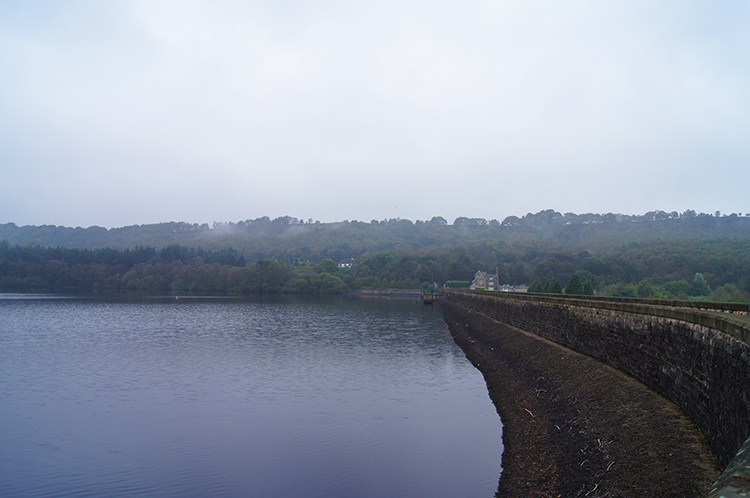 The walk along the drive was a joy and while it was quiet to the western end of my walk along it I did meet a few walkers when I reached my eastern terminal at Rivelin Dams. There was a car park near the dam and it was busy. Walkers were here and there, many of them dog walkers exercising their pets. 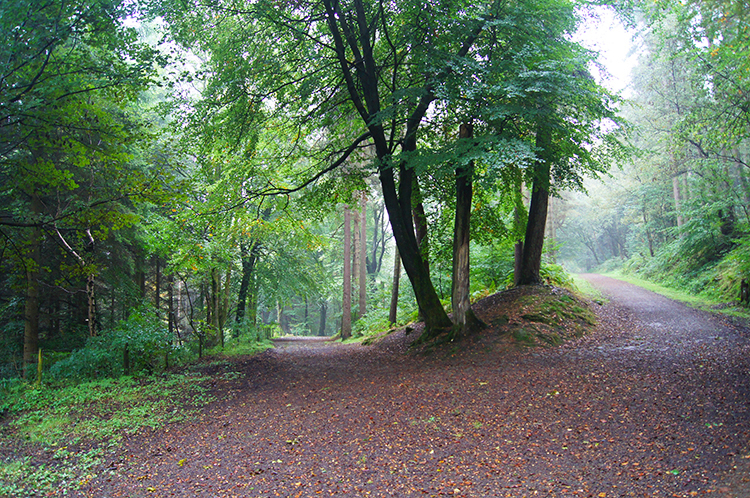 From Rivelin Dames my walks took me through a series of woodlands. 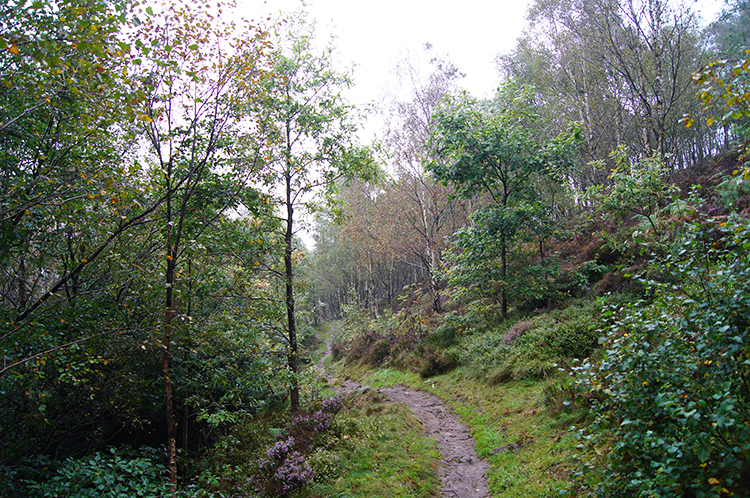 The first was Fox Hagg Nature Reserve which Sheffield and Rotherham Wildlife Trust extol as "A tiny reserve perched high on a hillside overlooking the Rivelin Valley". The patrons add "Looking out over the hills from Fox Hagg, you can see for miles - over the Rivelin dams and the woods of Wyming Brook further up the valley. The reserve's own varied and dramatic scenery is as stunning as the view, with its patchwork of bilberry, bracken, heather, birch, scrub, woodland and moorland. This huge range of habitats attracts a wide variety of birds including meadow and tree pipits, redstarts and linnets and a number of warblers which flit between the scattered birch and the woodland edge". I could not put it better myself, it is a lovely woodland environment to explore. 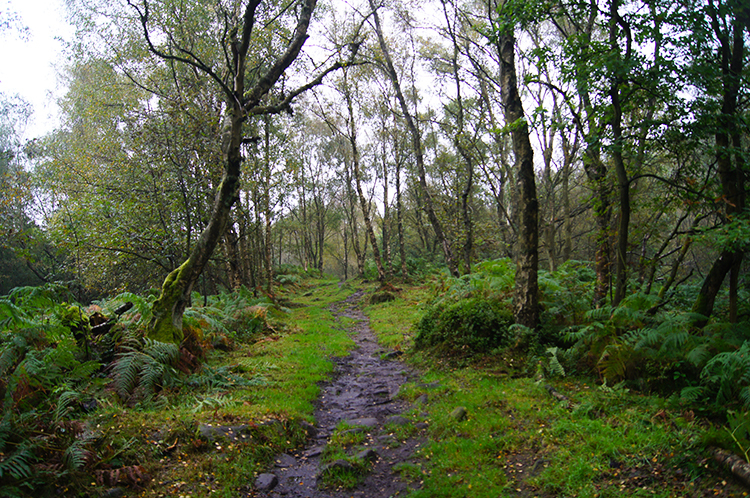 As was my next area of woodland which I reached on crossing Lodge Lane, the road which leads to Lodge Moor. 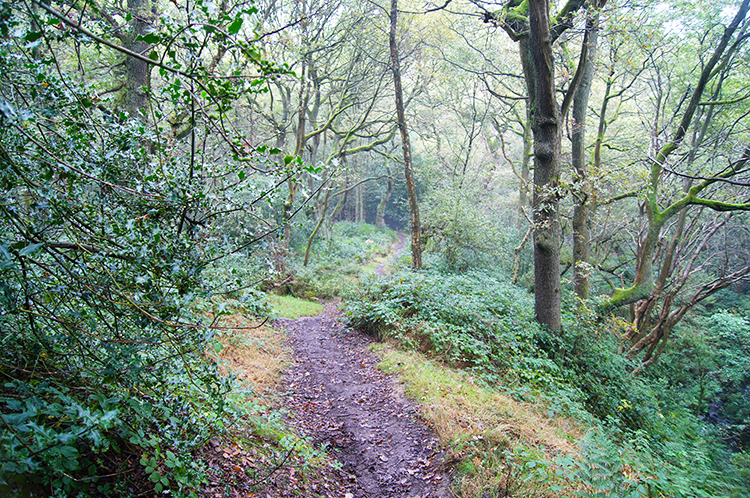 This was Blackbrook Wood, a woodland with excellent views to the Peak District and the city of Sheffield. I could feel I was drawing closer to Rivelin now and indeed I was as I followed the woodland down to where I crossed the A57 road near Coppice Farm. After crossing the A57 I walked through a short stretch of woodland and then I came to footbridge which marked the point where I was truly in the Rivelin Valley proper. I was stood beside the River Rivelin. I was a little surprised at the sight of the river, it more resembled a beck. Here it was a babbling brook at best but the setting in quiet rich woodland was lovely all the same. Perhaps even better than a mature river. Yes, better than, for sure. I crossed the footbridge of concrete and iron and then I followed the little river downstream. It trickled, a Dipper darted onto a rock in the water and I watched amusingly as it amused itself with a wash. Dippers love being in the water. After the avain entertainment I continued on my walk. Soon enough I came to weir on the river and immediately afterwards I arrived at the first of my Rivelin valleys mill ponds. I could not find any buildings and nor could I find any signs so I could not tell which one it was. Lets call it the mysterious one. 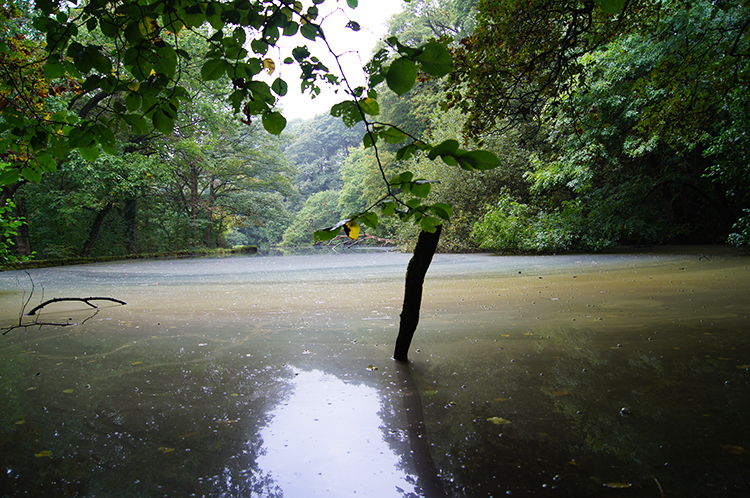 The mill pond was still and milky on top with muddy water. I would not guess their was much life in the mill pond. If I had fallen in I would surely come out mucky. I continued on from the mill pond and beside the cleaner flowing waters of the healthy looking river. A sign told me I was at the Round Dam at Hind Wheel. This was confirmed by a fixture of metal heritage which read "Hind Wheel. Waterwheels have worked here since 1581. By the 1820's there were two waterwheels, each working six grinding wheels. Bent over these wheels, men ground cutlery to shape. In the 1830's six of the twelve grinding wheels were used to shape metal inserts for women's corsets. The waterwheels kept working until the 1920's". After looking over the quiet site and imagining how noisy it must of being back then I continued on my walk following the river which was now cascading its way down into Sheffield to its end at its meeting with the River Loxley a little further on. I passed a few more sites of waterwheels, namely Upper Cut Wheel, Nether Cut Wheel, Little London Wheel, Holme Head Wheel, Roscoe Wheel and Spooner Wheel before I passed the site of some Allotments which heralded my arrival at Rivelin Bridge. I was nearing the end of my walk at Rivelin Park but before I arrived there I had an unexpected treat in store. 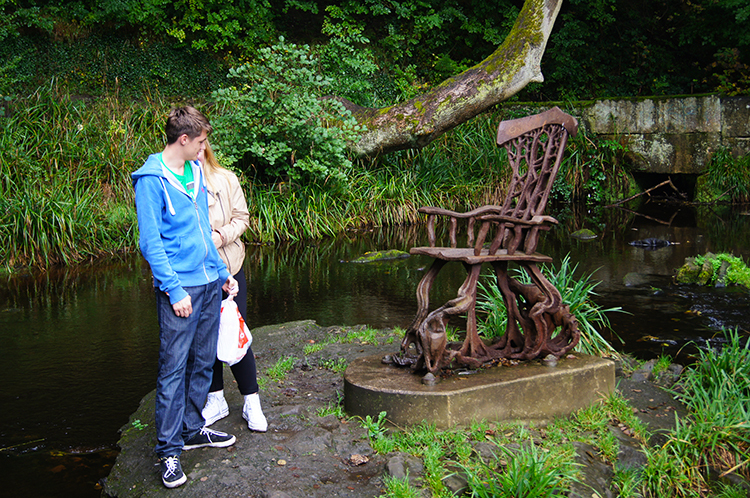 I came to a quirky sculpture in the form of a chair stood on a small island beside the river. Two young friends were admiring the chair, probably, as I was, trying to make out what it was there for. Obviously respectful landscape art. I found later that it was designed and produced by local artist Jason Thomson who wanted to reflect other pieces of ironmongery around the valley left behind from the mills, and the twisted tree roots winding around the old dam walls. It was installed in June 2011, by Sheffield City Council. I think it looks great in its setting. The youngsters agreed. I nominally finished this walk soon after at Rivelin Park. 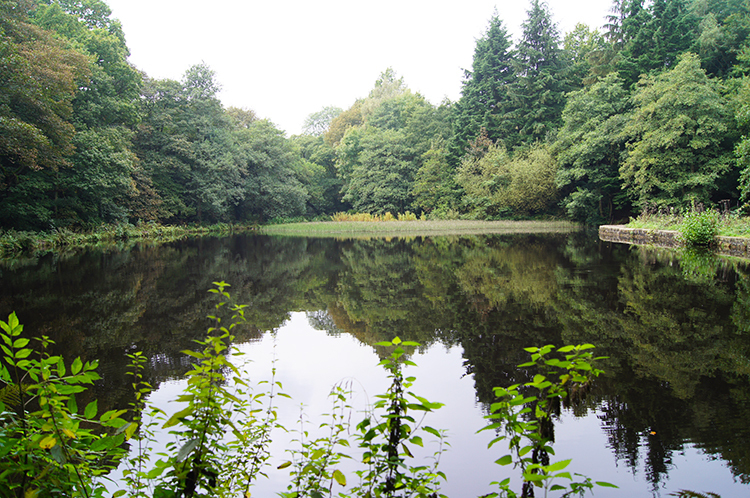 Perhaps finishing with refreshments at Rivelin Park Cafe is a suitable finale to such a fine walk, one of diversity which starts from an upland reservoir, crosses desolate moorland and then passes through a series of woods, all lovely and some nature reserves. 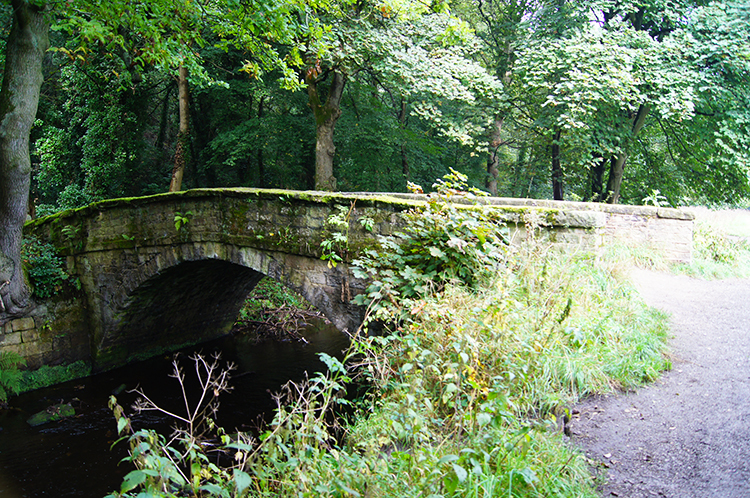 Next up is the interesting heritage journey through the Rivelin valley. So glad I passed on the city centre shopping!